As is the annual springtime tradition, a biologist scaled to the top of San Jose City Hall to band the batch of falcons living there. This year, there was a male and a female to band and track in the future. Each year Glenn Stewart, director of the University of California Santa Cruz’s Predatory Bird Research Group, rapells down the side of the City Hall tower to reach the nest where the eyasses hatched. Their mother has been named Clara, and since 2012, her paramour - and the father of the chicks - was nicknamed Fernando El Cohete, or Fernando the Rocket. Stewart said the eyasses are all doing great. "They're eating real well up there," he said." There, Stewart puts identification bands on their legs and determines their genders. He said he's always happy to go into a peregrine nest. "It's a real thrill to be up there with the birds," he said. 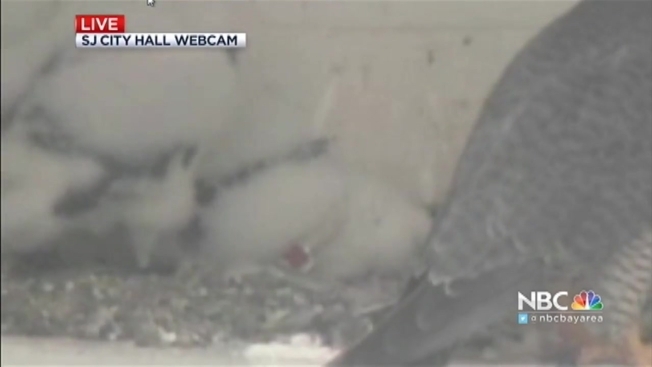 All of it can be watched on the city's FalconCam. To donate to the research group and find out more information about the San Jose and other falcons, visit www.scpbrg.org. For a link to the live falcon cam for Clara's nest, visit the predatory bird research group.